BELGIUM--Visualization specialist Barco is proud to announce a new line of LED-lit, DLP-based video walls with an improved LED engine. The new OVL range reaches a brightness level that is 20 percent higher than many competing systems, without shortening the projection system’s lifetime. 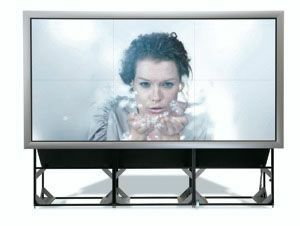 The OVL video wall range is offered in 4:3 ratio, with screen sizes up to 80 inch. Just like Barco’s 16:9 LED video walls, the new OVL series has an advanced heat management system based on liquid cooling technology, which brings the LED temperature down to the optimal level. This results in a significantly longer lifetime of the projection system, amounting to 80,000 hours of continuous operation in eco-mode – or a 35 percent improvement over competing video walls. Thanks to liquid cooling, it is possible to boost the OVL’s brightness level by 20 percent without shortening the system’s lifetime. Conversely, it is possible to prolong the system’s lifetime by lowering the brightness level. This way, Barco proves that liquid cooling is very effective in reducing LED aging effects. OVL video walls can save up to 30 percent power compared to other LED-based systems. Barco achieves this by basing the OVL’s color and brightness adjustment on smart power management, not on optical dimming. Thanks to the OVL’s new LED engine, offering higher brightness and higher efficiency, the use of larger screens has become possible. Barco's OVL range therefore includes an 80” video wall system with seamless screens, which is particularly interesting for utilities applications. An additional benefit over smaller size screens is the 80” OVL’s high mean time between failures.